A SWEET EASY-GOING GIRL: 10 years old / 29 lbs. and needs to lose weight Mostly Mutts adoption center is open Mon-Sat. 11-4pm. Some of us are in foster homes so please call 770-272-6888 1st to find out if I’m available to meet during the week. I’m a very sweet and even-tempered girl who loves to spend time with my people. In my foster home, I enjoy comfy doggie beds for lounging and when I wake up from a nap, I usually do the cute downward facing dog yoga pose. I am not a clingy or cuddly gal but I’m a great companion! My leash manners are very good, and I sure do enjoy walks and exploring with my nose to the ground! When I see kitties on my walks, I would surely chase them if given the chance, but I haven’t met kitties in a home, so that may be different, let’s meet. I met a bird at the shelter, and I did well with him. Since I need to lose a lot of weight, please make time for some nice walks so we can have fun and be healthy together! I’m an older gal who has developed arthritis along my spine, so I’m taking a medication for that and it’s helping me already! I’ll need to stay on it so I can feel my best and if you need to pick me up, the vet says it’s best to put one arm under the front of my chest and the other under my rear so that your hands meet in the middle and support the underside of my chest. In my foster home, my potty manners are very good on a schedule, though about six hours at home alone is probably the most I should go without a ‘let out’ for potty time. I also whine when I need to go outside, cause I’m a good girl! I do very well in my crate if you like when you have to run errands. I really liked the 16-year-old I met in a temporary foster home, so older kids in my home might be nice, though I wouldn’t want to live with a young child as I either scratched or slightly nipped a very young child in a temp. foster home, can’t recall which it was, and the adults did not see. 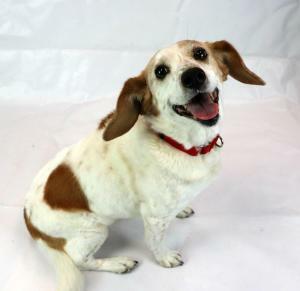 I may bark initially at strangers due to my Beagle breed, but I am such a friendly girl – once I know you are a nice person – be ready for cute tail wags from me! I love to play with toys and will tear up plush toys with ease, so maybe have some tough stuffed toys for me as a fun challenge? I met a few dogs at the shelter, and I liked them and was my usual sweet self towards them, but I’m not a super playful lady, so I probably won’t be interested in playing with a doggie companion. If you have a nice doggie at home, let’s meet to see if we can be pals. I have the softest fur and all the volunteers were admiring it one Saturday at adoptions, I felt so special! I had a kidney infection, but with good care it has cleared up and I’m feeling good now. I’m on a special food (c/d formula) to help support bladder and healthy urinary function and I’ll need to stay on that. I am a real sweetheart looking forward to being with my furever family soon! Energy level: 4-6. I'm current on vaccinations, micro-chipped, spayed, and my adoption fee is $299.00 which also includes an engraved name tag, Martingale collar and leash.